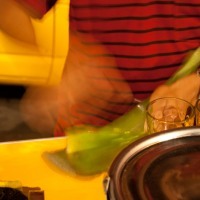 A stranger on a street energetically removes pulp of a plant resembling aloe. His swift and graceful hands adds some mysterious extracts from bottles arranged in a row. 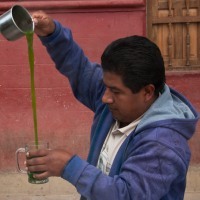 Then he scoops a cup of hot herbal brew out of a massive pot and starts blending all the ingredients with a spoon. Yet still the drink has to reach a desired consistency. This is done by pouring the content from one cup to another many times. The more spectacular way the better. 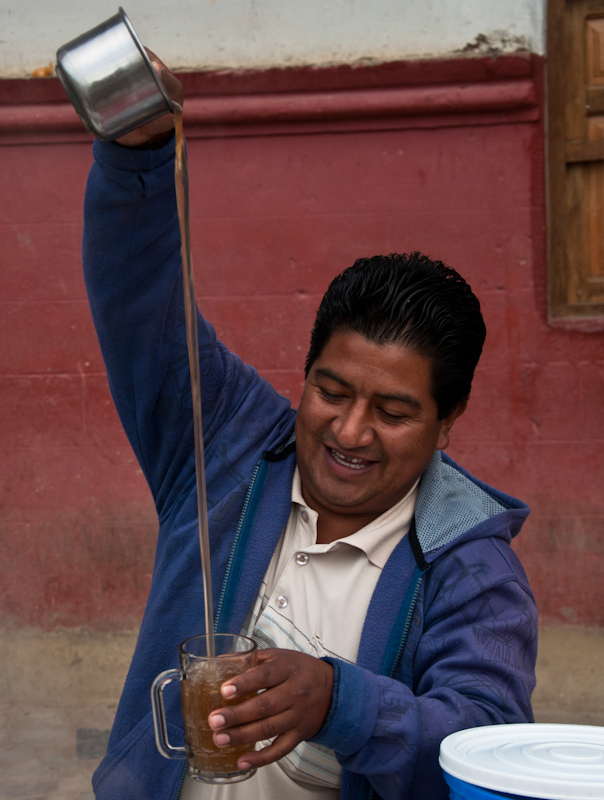 In the end, with a smile on his face he hands me a glass filled with a light-brown liquid of thick consistency. In fact it is quite unique drink. It is called emoliente. 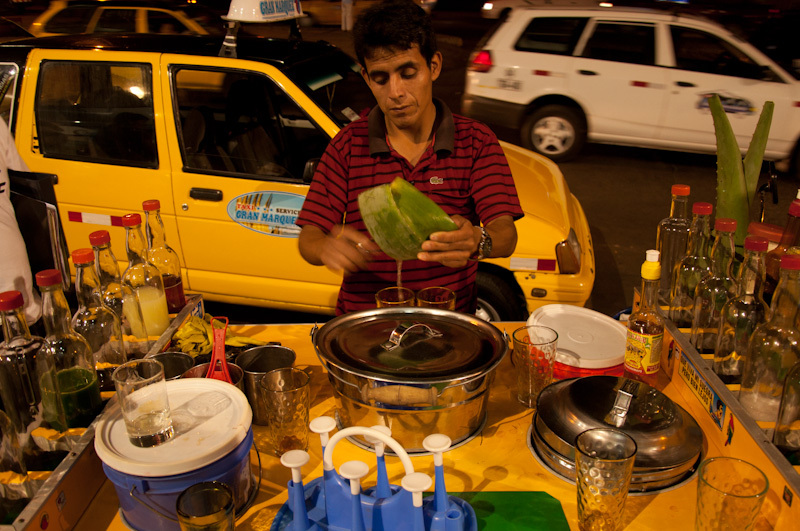 Every small town in Peru has its street vendor of emoliente. Local patrons are well informed about where and at what time to find this guy. 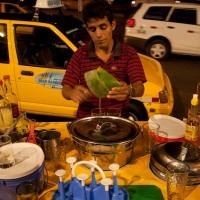 In general you find emoliente vendors around a market, a main square or on a busy street. Emoliente has warming properties, therefore it is commonly sold early in morning or in the evening. There are many varieties of emoliente. 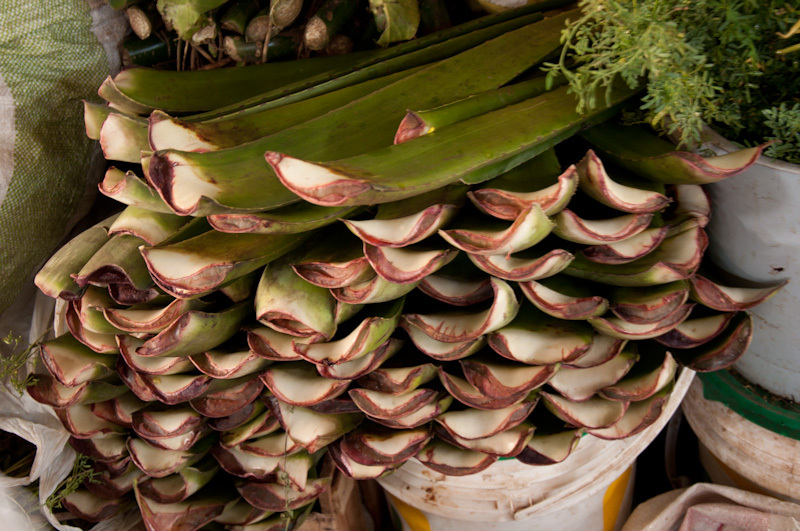 Its main ingredient is a special brew, prepared according to a home-made recipe with a frequent addition of herbs and fruits such as apples or pineapples. 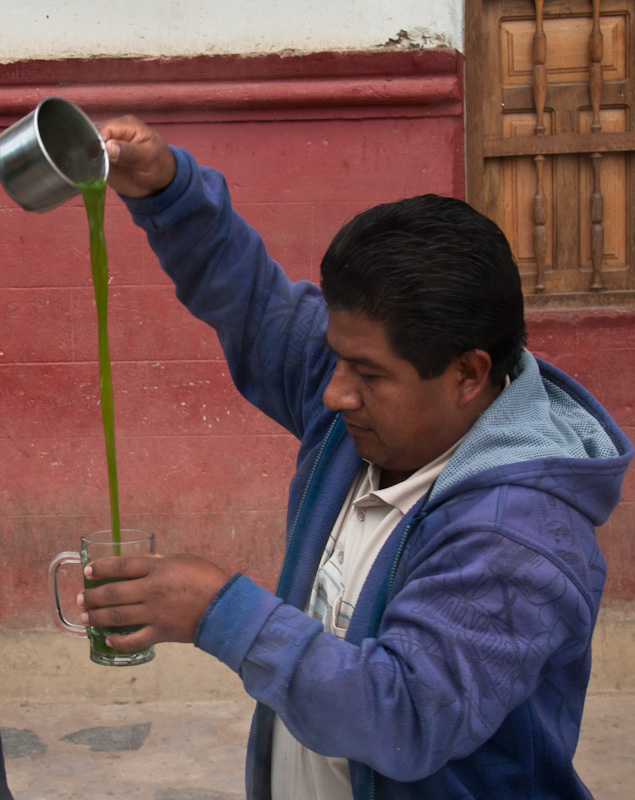 The ingredient that makes the drink unique is a plant sabila by which it gets a thick consistency. 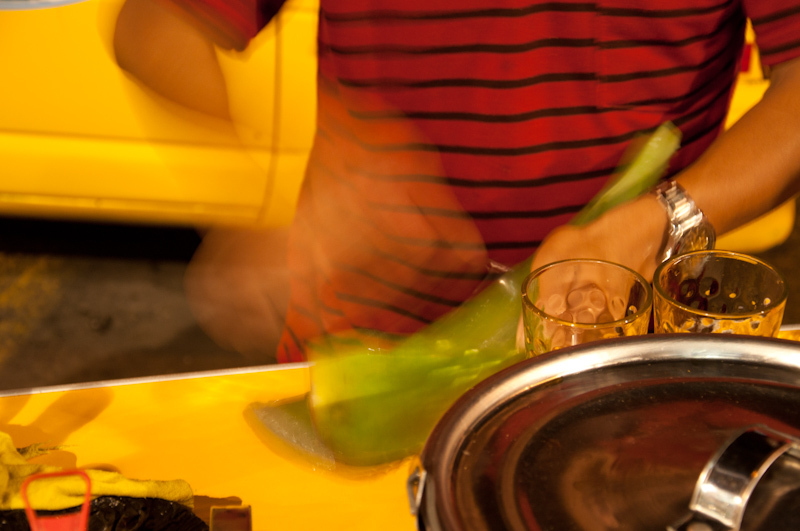 Sometimes sabila is prepared on the spot, other times they use a home-made extract. 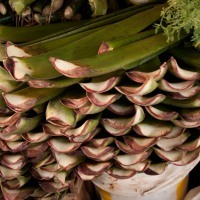 A dozen or so of bottles filled with different types of essences are prepared on the basis of herbs, leaves and roots. The combination of which affects on the final taste of emoliente. Emoliente prices range between half sol and a sol (around US$0.20-0.40). Every time ordering emoliente I try to get to know the seller. Most of them have many years of experience in this profession. This is not a profitable business, but rather an occupation requiring passion and systematic engagement. 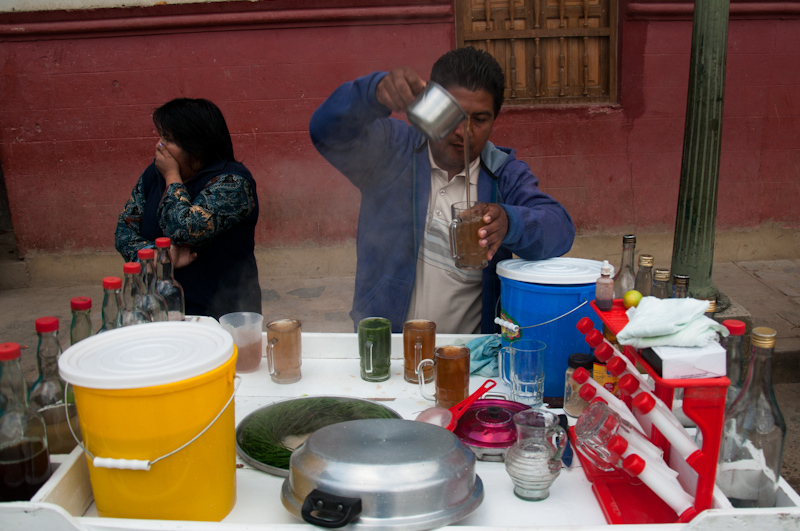 Sample vendor of emoliente earns about 30 sol per (assuming average sale of 60 drinks). 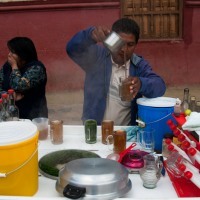 It is worth to mention that usually in the tourist destinations emoliente is prepared in a much less spectacular way. In order to experience the true and exceptional quality of this service, I strongly recommend you to get lost in less visited parts of Peru. Early in the evening there certainly will be a real expert, who having already prepared his stall will await first customers with a smile on his face, ready to serve a masterpiece glass of warm emoliente. Probably the best thing about emoliente is that every order you place the drink comes out to be different than previous. It makes it even more a unique and worth-trying experience.